You'll Need A Flexible Key To Open "The Weirdest Lock On Earth"
It's been said there's no such thing as an unpickable lock. That may be true – but this innovative lock assembly just bested one of the Internet's most famous lock-pickers, who calls it "the weirdest lock on Earth." 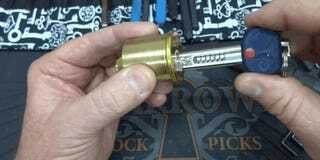 As YouTuber bosnianbill explains in the video, picking this lock cleanly – i.e. without cracking it open – poses a considerable challenge. "This is not going to be a lock-picking video," he admits, "simply because I cannot pick this lock." It's bears mentioning that bosnianbill's YouTube channel boasts upwards of 50,000 subscribers, and hosts over 600 lock-picking videos. This is a man whose idea of "cross-training" is to pick locks while mountain biking, which should tell you all you need to know about his prowess. With a standard pick, "I can only pick the first pin," he says. "Beyond that, I can't get the pick up inside of there." When he wonders aloud how such a lock might be picked, his answer is to show us the key. "You push the key and you'll actually inject it into the lock, it goes around those curves, and then it actually works, very smoothly... so that's how you get in there." bosnianbill doesn't disassemble the lock – "I really would love to see the innards," he says, "but I don't want a thousand pieces springing out and not be able to get this thing back together" – but I did manage to track down a few patents, originally filed by an inventor by the name of Yun-Tung Hsu. According to one of the filings (there appear to be several iterations of the mechanism, filed in different countries over the course of the 1990s), one of the challenges posed by such a lock is to design a key flexible enough to negotiate the keyway's turns, but stiff enough " to allow necessary movement of the key inside the keyway in order to transmit a torque." I've included images from the patents below, but you can check out more details here, here, and here.